Protopresbyter Alexander Schmemann: John Meyendorff, "Thanksgiving"
Fr Alexander celebrated his last Divine Liturgy here with us on Thanksgiving Day on November 24. Those of us who prayed with him in this Chapel on that day remember how, at the end of the Liturgy, he called on all of us to give thanks to God  for the Liturgy which we had just celebrated, for the joy and communion which was given to us in the holy Church, for our common ministry at St Vladimirs Seminary, for our family joys, for the children around us, and even for the noise they occasionally make in church. This last Thanksgiving was so characteristic of Fr Alexanders personality! More than anybody I ever met, he was always able to acknowledge and to celebrate the gifts of life, and to understand his own personal functions, as priest and as theologian, in thanking God for these gifts. Is not "thanksgiving" (eucharistia) at the very center of Church life? Fr Alexander was ready and happy, until practically his last breath, to thank God for all, and by so doing, he won an obvious victory, a clear triumph over suffering and death itself. But was that Liturgy on Thanksgiving Day really his "last" Liturgy? Our Christian faith tells us clearly: no, indeed. For we know that, every time the Eucharist is celebrated, it unites in Christ the living and the dead, the saints of all times, and all our brothers and sisters who were  or still are  dear to us. So, always, in this Chapel, Fr Alexander will continue to give thanks to God with us, and we will be one with him in this Thanksgiving. As we pray today for the repose of his soul and for the remission of his sins, voluntary or involuntary, and as we ask God to forgive our offenses against him, it is our first duty to join him in this continuing thanksgiving. This is the best way to follow the example that Fr Alexander gave us. Let us, therefore, first of all, thank God for having given Fr Alexander to the Church, to the Seminary, and to each one of us personally. It is truly extraordinary to realize how many people very personally were reached by him in his ministry  throughout this country, both Orthodox and non-Orthodox  and also, certainly an even greater number in the country of his ancestors, through his preaching in the Russian language on Radio Liberty. All of them, known and unknown, he succeeded in uniting around himself in Christ. For this, let us give thanks. Here, at this Seminary, his colleagues, his students, and all the alumni were kept together, against so many odds, around Fr Alexander, but always in Christ. For this, let us also give thanks. His is a wonderful family, united as ever  Juliana, children and grandchildren  and he always stood in the middle, gathering them around himself, in Christ. This unity is not ended today, so that we can give thanks for it. In this fallen world, our every step is being watched by the Divider (diabolos), Satan, who thrives only in enmity, separation and death. All of us will be judged by our ability to resist that evil spirit. 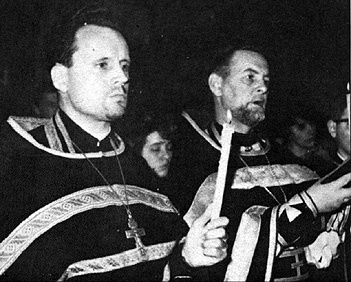 It is through his ministry of uniting people in Christ, that Fr Alexander, in his last days with us, has been able to demonstrate, not only in words but also in deeds, so obviously and so triumphantly, that Death was indeed overcome by Life, that the risen Christ has trampled down the powers of Satan. For the model and the example he thus leaves for us, let us give thanks, not only in words but also in deeds, so that  in the Spirit of God  we many continue to share in that communion, in that joy, and in that courage, of which Fr Alexander remains for us our ever-living image. Amen.